A man said to be mad in the streets of Yenagoa, the capital city of Bayelsa State killed and removed the brain and eyes of a young girl at Akenfa 2 Epie in the early hours of Thursday, March 21, 2019 at about 5am-6am in the morning. The supposed mad man was on the run as the people of Akenfa was chasing him, on trying to cross a river, a fishing net trapped him, which the people of Akenfa caught up with him and burnt him alive. 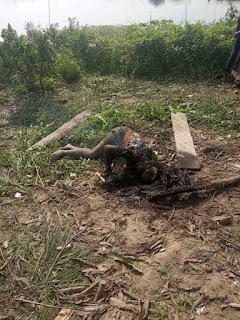 Just a few minutes after he was set ablaze by the angry youths of Akenfa, the police came to the scene of the crime where the girl was killed and they went to hide out of the said mad and found guns, mortar pistol and other weapons. With findings and to come to a conclusion, I will say, he wasn’t a mad man at all, rather a ritualist in the city of Yenagoa. My advice to the general public is that, we all should be vigilant at times like this, because not all mad looking men are mad men. Most are ritualists and kidnappers in our society. God help us all.